COLUMBUS, Ohio (AP) — An SUV crashed after all four occupants overdosed on heroin in North Carolina. The same day, a man in Williamsport, Pennsylvania, grabbed the steering wheel after his grandson lost consciousness while driving. Police in the city of 30,000 responded to 11 other overdose reports that day, including a woman who crashed her car just before a highway entrance. 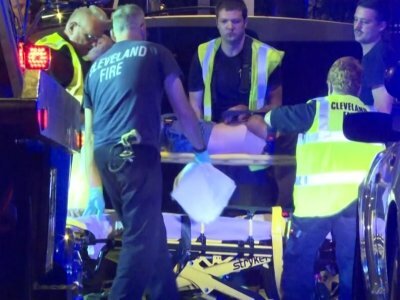 The next day in Cleveland, a rescue squad found an unconscious 43-year-old man who had driven off the road and hit a pole. An overdose antidote brought him back around, police say. He was seriously hurt from the crash and was cited for driving under the influence. Car crashes caused by overdosing drivers are becoming so commonplace, authorities say, that some rescue crews immediately administer the antidote, naloxone, to any unresponsive driver they find at an accident scene. People who use heroin and related drugs are sometimes so eager to get high, or so sick from withdrawal, that they’ll shoot up in the car as soon as they get their hands on more, police say. Often they’re back on the road before the overdose takes hold, and they lose consciousness, a recipe for traffic accidents. Police in New Hampshire charged a man with driving under the influence June 7 after he allegedly shot up heroin before crashing into a parked tractor-trailer in Manchester. A man who shot up in a Kmart parking lot in Iowa City, Iowa, in March crashed his car and was revived with naloxone. Last month, according to police, he led them to the dealer who sold him heroin laced with the potent opioid acrylfentanyl. Pickett’s attorney said he intends to use an insanity defense against charges that include second-degree murder. Pickett’s trial is set for Sept. 18. If convicted, he could face life in prison. Two years ago, Koriann Evans had just picked up her 2-year-old son and 5-year-old daughter from her mother’s when her dealer reached out to her. She shot up in a parking lot in Fremont, Ohio, and then headed down the road. Within a few minutes, she couldn’t breathe. With her children in the back, Evans managed to stop in the middle of the road with her foot on the brake before passing out. Nearby residents pulled her and her children from the car and called authorities. Rescuers told her she would have died quickly without the naloxone she was given. Now more than two years sober, the 36-year-old Evans works in a vinyl siding factory while trying to become a substance abuse counselor. She lost custody of her children but sees them regularly. “I knew from that point on that something had to change within me, because the reality is that my addiction, my use almost killed me, my two kids and possibly somebody else,” Evans said. Drunken-driving deaths are on the decline, dropping 24 percent since 2006, according to the National Highway Traffic Safety Administration. Meanwhile, deaths in crashes involving drugs are soaring. Ohio saw 4,615 drug-related crashes last year, an increase of more than 21 percent since 2013, according to the state Department of Transportation. The data aren’t broken down by type of drug. Pennsylvania saw a similar spike, with drugged-driving crashes jumping from 3,019 in 2011 to 4,078 last year. Nationally, fatalities in crashes where drugs were involved soared from 2,003 in 1993 to 7,438 in 2015, according to the most recent data from the National Highway Traffic Safety Administration. The data reflect only the presence of drugs in a driver, not whether the drugs caused the crash. In Columbus, the number of emergency runs by the fire department involving naloxone administered to someone in a vehicle has jumped each of the past three years and is headed for another record this year, according to fire department statistics. Many of the runs involve people overdosed in parked cars, whether in parking lots, near their homes or sitting in the middle of an intersection after they nodded off. Some people using drugs are known to purposely shoot up in running cars with their foot on the brake, figuring that if they pass out, the car will move and alert someone to their condition, said James Davis, assistant fire chief.